❤Multiple compartments to neatly hold all the items. ❤Portable design, easy to take it with you for traveling, hiking, camping or home use. ❤This little medicine pocket is excellent for your luggage/handbag/glove box. ❤Well keep your accessories organized on your trip. ❤It's small and portable but can hold a surprising amount of items and looks adorable too! ❤Really a handy little holder,you can use it for your medication when going away. It is perfect and keeps everything in one place. ❤This medicine storage bag to go in your new car,you will feel safer knowing that you have most of what you would require in case of accidents. 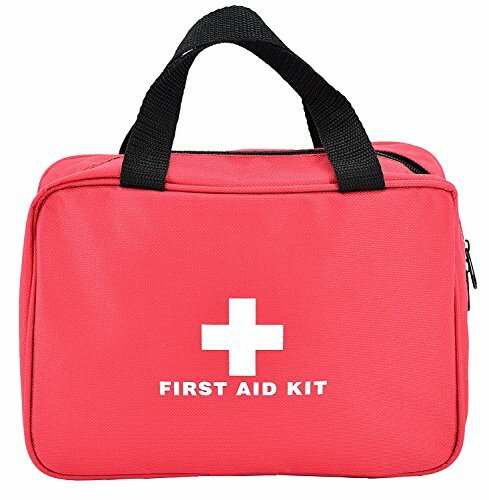 ❤This first aid kit is very well made and sturdy,provide a good protection for first aid accessories at anytime anywhere. This first aid pouch is made of high quality Nylon material, very durable and waterproof ,well protect items from being damp and damaged. 25 x 18 x 8cm/9.8x7.1x3.1inch,the medcial package is small and light weight ,excellent for your luggage/handbag/glove box or put in the car,potable to carry and store emergency medical products for outdoor activities and drive trip. Double zipper,fully open,built in several devided compartments and mesh bag, helps to classify and find the medicine you need quickly and stores them well-regulated. The medicine storage bag is in stout structure design with good function of dustproof, quakeproof, hard-wearing,dense stitching and seams with strong nylon handle,good protection and easy to use. This emergency medical kit is with big capacity, good to place some medical products for emergency,also perfect for any little items for outdoor activities or sanitary napkin storage. If you have any questions about this product by Lanticy, contact us by completing and submitting the form below. If you are looking for a specif part number, please include it with your message.